Gamblogger: Vive La France! PKR Qualifier Turns US $5 into Over $HK3,000,000! Vive La France! PKR Qualifier Turns US $5 into Over $HK3,000,000! Allain, known by many as ‘zlatan35’ online, now aims to use the winnings as a bankroll to push forward his poker career. He impressively dominated the final table that included the likes of Poker Pack star JC Tran, Casey Kastle and David Steicke. No mean feat when this is your first major event and your biggest previous win is online and US$8,000! The runner-up was Inwook Choi from Korea. Choi got his money in with the best hand after pushing with AQ but Allain spiked a 3 on the flop and his A3 was enough to take the title. That said - Allain had been like a train since the first card was dealt and had Choi dominated 2,182,000/1,078,000 at the heads-up stage. As Asian Poker Tour CEO Chris Parker expressed his congratulations, Adrien’s delighted group of supporters waved French flags in celebration as the Asian Poker Tour closing ceremony at the Starworld Hotel and Casino drew to its customary colourful conclusion. The crowd of supporters grew throughout the afternoon after the now legendary Asian Poker Tour Macau Party in the Presidential Suite the night before. There were five small stacks on the final table and after shuffle up and deal was called by the world’s leading tournament director Matt Savage, the action was fast and furious. First out was Casey Kastle, who departed after the third hand on his third consecutive Asian Poker Tour final table appearance! He was followed very shortly by Winifred Yu, who came to the Starworld Hotel and Casino as a member of the crew for Chinese poker language film ‘Poker King’ and left with a HK$26,112 final table payout.Christer Hallberg was next to exit, followed by Michael Woo. By this point Allain was making all the play and could do no wrong and had built himself a significant chip lead. In the background, dangermen JC Tran and David Steicke were lurking but the young Frenchman’s stack was continuing to tower. Next to go and out in fifth was Chris Chau, followed by Steicke – whose fourth place finish caps a memorable Asian Poker Tour Macau Festival for him which saw him also take down the Poker Pack High Rollers event. What followed was a long session of small ball poker with Allain continuing to dominate, Inwook Choi holding up well and poker superstar JC Tran seriously short stacked but fighting back. In the end Inwook Choi’s queen high straight saw off Tran’s challenge, much to the disappointment of the large group of Poker Pack supporters on the rail. It has been a fantastic 12 day festival for The Poker Pack. Tran won The Poker Pack headhunter event and Korea, featuring Steve Sung, David Chino’ Rheem and Brandon Wong, won the inaugural JBET Battle of the Nations event. Quinn Do took down ‘The Poker King Movie’ Celebrity Charity event, while David ‘Chino’ Rheem won the HKGC No Limit Hold ‘em R+A side event. Day 1B marked the start of filming of ‘Poker King,’ the first Chinese language poker film. Many, including the legendary Johnny Chan, predict the movie could have the ‘Rounders’ effect on the growth of poker in Asia. Five of the crew entered the Main Event with Hong Kong’s Winfred Yu making the final table! It would be fair to say that Poker King nearly had its own Poker King! There was an encouragingly large regional contingent taking part in the event, with over 50% of the Day1A field from Asia. There were also plenty of well known names at the StarWorld Hotel and Casino including ‘The Poker Pack,’ John Juanda, Johnny Chan, Liz Lieu, James Akenhead of the WSOP Main Event November Nine, the in-form Stewart Scott, David Chiu, Ian Frazer, Praz Bansi, JP Kelly, Young Phan, Amnon Filippi, Casey Kastle, Steve Yea, David Steicke, Cecilia Nordenstam, Liv Boeree, Mel Judah, Karl Mahrenholz and Kim Wooka. Chan, Frazer, Scott and Wooka were amongst those that cashed. Last year’s champion Yevgeniy Timoshenko was also in attendance and failed to cash in the Main Event. Tournament Director Matt Savage confirmed that there were a total of 326 runners, 133 on Day 1A and 193 on Day 1B. The total prize pool was HK$10,919,040 with first place HK$3,035,000. The buy-in for the Main Event was set at HK$34,400. Last year’s event attracted 257 runners. 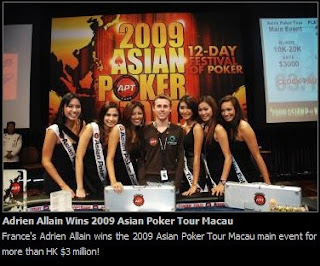 The Asian Poker Tour Macau hosted over 20 events with 15 official side events. Amongst the online networks which sent players were The Ongame Network, the iPoker Network and PartyPoker.com. In addition, online rooms BWin, PKR, Dafa Poker, JBET Poker, Betfriends, 888.com, Titan Poker, RedKings, 32Red, ChiliPoker, Winamax, BetSafe, PafPoker, The Asia Poker, JPL and PokerLoco are in on the action which guaranteed the significant online qualifier contingent.